The genetic features that facilitate Campylobacter jejuni’s adaptation to a wide range of environments are not completely defined. However, whole genome expression studies showed that respiratory proteins (RPs) were differentially expressed under varying conditions and stresses, suggesting further unidentified roles for RPs in C. jejuni’s adaptation. Therefore, our objectives were to characterize the contributions of selected RPs to C. jejuni’s i- key survival phenotypes under different temperature (37°C vs. 42°C) and oxygen (microaerobic, ambient, and oxygen-limited/anaerobic) conditions and ii- its interactions with intestinal epithelial cells from disparate hosts (human vs. chickens). C. jejuni mutant strains with individual deletions that targeted five RPs; nitrate reductase (ΔnapA), nitrite reductase (ΔnrfA), formate dehydrogenase (ΔfdhA), hydrogenase (ΔhydB), and methylmenaquinol:fumarate reductase (ΔmfrA) were used in this study. We show that only the ΔfdhA exhibited a decrease in motility; however, incubation at 42°C significantly reduced the deficiency in the ΔfdhA’s motility as compared to 37°C. Under all tested conditions, the ΔmfrA showed a decreased susceptibility to hydrogen peroxide (H2O2), while the ΔnapA and the ΔfdhA showed significantly increased susceptibility to the oxidant as compared to the wildtype. Further, the susceptibility of the ΔnapA to H2O2 was significantly more pronounced at 37°C. The biofilm formation capability of individual RP mutants varied as compared to the wildtype. However, the impact of the deletion of certain RPs affected biofilm formation in a manner that was dependent on temperature and/or oxygen concentration. For example, the ΔmfrA displayed significantly deficient and increased biofilm formation under microaerobic conditions at 37°C and 42°C, respectively. However, under anaerobic conditions, the ΔmfrA was only significantly impaired in biofilm formation at 42°C. Additionally, the RPs mutants showed differential ability for infecting and surviving in human intestinal cell lines (INT-407) and primary chicken intestinal epithelial cells, respectively. Notably, the ΔfdhA and the ΔhydB were deficient in interacting with both cell types, while the ΔmfrA displayed impairments only in adherence to and invasion of INT-407. Scanning electron microscopy showed that the ΔhydB and the ΔfdhA exhibited filamentous and bulging (almost spherical) cell shapes, respectively, which might be indicative of defects in cell division. We conclude that the RPs contribute to C. jejuni’s motility, H2O2 resistance, biofilm formation, and in vitro interactions with hosts’ intestinal cells. Further, the impact of certain RPs varied in response to incubation temperature and/or oxygen concentration. Therefore, RPs may facilitate the prevalence of C. jejuni in a variety of niches, contributing to the pathogen’s remarkable potential for adaptation. Campylobacter jejuni, a Gram-negative bacterium, is a leading cause of foodborne gastroenteritis . In addition, C. jejuni infections are associated occasionally with serious neuropathies and other significant sequelae in humans . Historically, this bacterium has been considered fastidious, requiring microaerobic atmosphere and complex media for optimal growth under laboratory conditions. However, C. jejuni has been isolated from a variety of animals, such as poultry and cattle, as well as other ex vivo niches [2, 3], which highlight the remarkable capability of this bacterium for persistence in different environments as well as its adaptation potential. Despite lacking classical stress response mechanisms , C. jejuni has disparate traits that promote its adaptability, including a competency for natural transformation and a highly branched respiratory chain [5, 6]. The latter is composed of individual respiratory proteins (RPs) that impact vital functions in C. jejuni, spanning growth and host colonization [5, 7–11]. The RPs include formate dehydrogenase, hydrogenase, fumarate reductase, nitrate and nitrite reductases, and others that facilitate the transfer of electrons (from donors to acceptors), which drives respiration and, as such, energy metabolism in C. jejuni[5, 11]. Further, whole genome expression studies and other transcriptional analyses showed that genes encoding RPs were differentially expressed in response to shifts in temperature, pH, and oxygen concentration [7, 12–14]. Additionally, many RPs in C. jejuni are transported via the twin-arginine translocation (Tat) system , which is specialized in the translocation of pre-folded substrates, including cofactor containing redox proteins, across the cytoplasmic membrane. Of relevant interest is the impairment of the Tat function in C. jejuni, which leads to pleiotropic phenotypes, including defects in motility, biofilm formation, flagellation, resistance to oxidative stress, and chicken colonization . These phenotypes are likely the result of multiple additive effects caused by defects in translocation of the Tat substrates, including RPs. Taken together, these observations further suggest that RPs might impact various adaptation and survival phenotypes in C. jejuni. However, beyond the aforementioned studies and the role of RPs in C. jejuni’s respiration, little is known about the contributions of these proteins to the success of C. jejuni under changing environmental conditions; a property that is critical for understanding the transmission of this pathogen between environments and hosts. Therefore, in this study, we describe the role of five RPs that were predicted to be Tat-dependent  in C. jejuni’s motility, resistance to hydrogen peroxide (H2O2) and biofilm formation under different temperature and/or oxygen conditions. We also assessed the contribution of RPs to the bacterium’s in vitro interactions with intestinal epithelial cells of two important hosts (humans and chickens). For these purposes, C. jejuni strains with deletion in five individual genes encoding essential RPs subunits were used. The mutations targeted the nitrate reductase (ΔnapA; Cj0780), nitrite reductase (ΔnrfA; Cj1357c), formate dehydrogenase (ΔfdhA; Cj1511c), hydrogenase (ΔhydB; Cj1266c), methylmenaquinol:fumarate reductase (ΔmfrA; Cj0437; this gene was previously identified as encoding a succinate dehydrogenase subunit, sdhA). It was previously shown that the deletion of these genes resulted in the loss of the catalytic functions of the associated respiratory enzymes; however, the mutants retained a generation time that was similar to that of the parental strain [8–10]. Although the mutants’ role in respiration has been previously investigated, neither the impact of the cognate RPs on survival phenotypes such as H2O2 resistance and biofilm formation nor their potential contribution to adaptation under varying temperature and oxygen conditions were analyzed. Further, the potential interactions of these mutants with human and chicken intestinal cells were not characterized. Here, we show that individual RPs can contribute to C. jejuni’s motility, oxidative stress response (H2O2 resistance), biofilm formation, and in vitro interactions with host cells. Our data highlight a role for RPs in C. jejuni’s adaptation to different environmental conditions as well as its in vitro interactions with intestinal cells of disparate hosts. C. jejuni’s motility is considered important for effective colonization of hosts as well as chemotaxis  and, subsequently, persistence in different niches. Therefore, we investigated whether the deletion of the RPs might differentially impact C. jejuni’s motility in response to different temperatures. Examination under scanning electron microscopy showed that none of the mutants were defective in flagellation, regardless of the incubation temperature (data not shown). Further, the mutants’ motility was evaluated using 0.4% semisolid agar as described elsewhere [15, 17]. Using this method, motility under anaerobic conditions could not be accurately assessed, because the zones of motility were not defined and sufficiently large for reliable measurement. This precluded the assessment of the effect of oxygen concentration on motility. However, our results show that during incubation under microaerobic conditions, ΔfdhA displayed significantly decreased zone of motility as compared to the wildtype, while the deletion of hydB did not impact this phenotype (Figure 1a, Table 1). Alternatively, ΔnapA, ΔnrfA, and ΔmfrA exhibited significantly increased motility as compared to the wildtype (Figure 1a, Table 1). Since the oxidation of formate is considered a major energy source for C. jejuni, the motility defects that are displayed by the ΔfdhA as compared to the other mutants and the wildtype strain can be perhaps attributed to the role of the formate dehydrogenase in energy metabolism. The mutants’ impact on motility and H 2 O 2 resistance under different incubation conditions. (a) The diameter of the zone of motility was measured under different incubation temperatures and compared to the wildtype. (b) H2O2 resistance was assessed using a standard diffusion method. Microaerobic and anaerobic atmospheres are abbreviated as “Micro” and “Ana”, respectively. Statistically significant (P < 0.05) differences are highlighted with * and indicate comparisons with the wildtype. The experiment was repeated three times independently and samples were tested in triplicate per experiment. Data are presented as mean ± standard error. Res. H2O2 and PIC indicate resistance to hydrogen peroxide and primary chicken intestinal epithelial cells, respectively. Microaerobic, anaerobic, and ambient oxygen incubation conditions are abbreviated as “Micro”, “Ana” and “O2” respectively, while adherence, invasion and intracellular survival are abbreviated as “Adh”, “Inv” and “Intra”. Statistically significant increases or decreases (P < 0.05) as compared to the wildtype are indicated by ↑ and ↓, respectively, while NS indicates no significant differences. Incubation at 42°C significantly increased the zone of motility for all the strains as compared to 37°C (Figure 1a, Table 1). This suggested that C. jejuni’s zone of motility was responsive to temperature, which corroborates results observed in other bacteria [19, 20]. Further, although the ΔfdhA remained defective in motility as compared to the wildtype at 42°C, its motility zone was significantly larger at 42°C as compared to 37°C (Figure 1a, Table 1). Subsequently, our results suggest that the severity of the ramifications associated with an RP mutant’s impaired motility might be dependent on the temperature of a host or a niche (e.g. ~ 37°C human body temperature vs. the 42°C of chickens). During its transmission between hosts and environments, C. jejuni encounters different concentrations of oxygen that range from oxygen-limited (hosts’ guts) to ambient (ex vivo) conditions, which indicates that oxidative stress resistance mechanisms are essential for the success of this pathogen. In other studies, fumarate reductase, formate dehydrogenase, and hydrogenase were found to contribute to oxidative stress responses in Bacteroides fragilis, Desulfovibrio vulgaris, and Geobacter sulfurreducens, respectively [21–23]. In C. jejuni, the genes encoding nitrate reductase were shown to be repressed in a PerR (peroxide stress regulator) mutant and after exposure to H2O2 and iron, which fuel the Fenton reaction and the production of hydroxyl radicals , while mfrA is oxygen regulated . Consequently, we assessed the contributions of RPs to C. jejuni’s H2O2 resistance under different temperature and oxygen conditions using a standard diffusion assay [17, 24]. Our results indicated that under all incubation conditions both ΔnapA and ΔfdhA were significantly more sensitive to H2O2, while ΔmfrA showed more resistance to the oxidant (Figure 1b) as compared to the wildtype. The altered susceptibility to H2O2 associated with different RPs, suggests that disparate RPs might be working collaboratively to maintain the homeostasis in C. jejuni during H2O2 stress. This is conceivable since in E. coli oxidized redox enzymes can lead to the formation of superoxide anions and H2O2. Although the genes encoding the RPs included in this study, with the exception of mfrA, are known to be upregulated at 42°C , the higher incubation temperature did not drastically alter the observed H2O2 resistance phenotypes for four mutants (Figure 1b). However, ΔnapA’s susceptibility was always significantly more pronounced at 37°C (Figure 1b), but the precise reasons for this temperature associated impact and its importance (e.g. in terms of human host colonization) are currently not clear. Biofilm formation is an important mechanism for survival and persistence of C. jejuni in the environment . 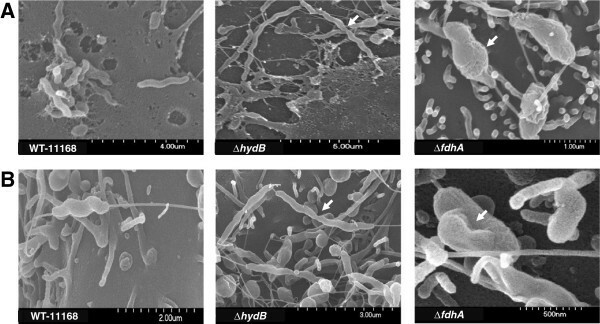 Since formate dehydrogenase and nitrite reductase have been implicated in biofilm formation of two important bacterial pathogens, Staphylococcus aureus and Pseudomonas aeruginosa, respectively [27, 28], we investigated the role of RPs in C. jejuni’s ability to form biofilms under different environmental conditions using the crystal violet staining assay [15, 17]. Our results clearly show that RPs can impact biofilm formation in C. jejuni. 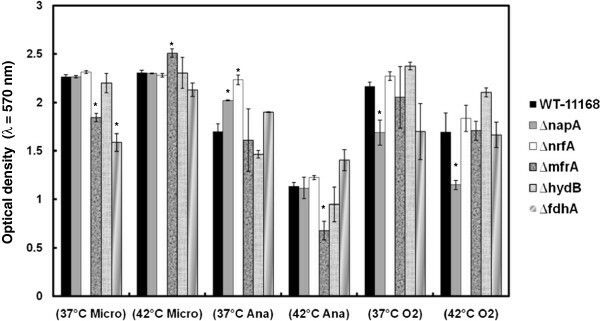 For example, ΔfdhA and ΔnapA were significantly deficient in biofilm formation at 37°C only in a microaerobic atmosphere and under ambient oxygen, respectively, while ΔnrfA and ΔnapA displayed an increased biofilm formation at 37°C only in anaerobic conditions (Figure 2, Table 1). Therefore, our results also show that the impact of certain RPs on the biofilm phenotype was dependent on incubation temperature and/or the oxygen concentration (Figure 2, Table 1). For example, as compared to the wildtype, the ΔmfrA displayed significantly deficient and increased biofilm formation under microaerobic conditions at 37°C and 42°C, respectively (Figure 2, Table 1). However, under anaerobic conditions, the ΔmfrA was only significantly impaired in biofilm formation at 42°C (Figure 2, Table 1), while under aerobic conditions and regardless of the temperature, there were no defects in the ΔmfrA’s biofilms as compared to the wildtype (Figure 2, Table 1). The mutants’ impact on biofilm formation under different incubation conditions. Microaerobic, anaerobic, and ambient oxygen incubation conditions are abbreviated as “Micro”, “Ana” and “O2” respectively. Statistically significant (P < 0.05) differences are highlighted with * and indicate comparisons with the wildtype. The experiment was repeated three times independently and samples were tested in at least three replicates per experiment. Data are presented as mean ± standard error. The observed impact of RPs on biofilm formation is likely mediated by multiple factors, including the metabolic and energy requirements that facilitate efficient growth and persistence in response to the properties of a given niche. However, our results highlight the overall importance of RPs in C. jejuni’s adaptations to different niches as well as their differential contribution to promote the pathogens survival and cognate persistence via biofilm formation in disparate environments. Since RPs contribute to C. jejuni survival phenotypes in a manner that was dependent on the incubation temperature and/or oxygen concentration, it was important to investigate if the deletion of RPs will impact C. jejuni’s interactions with the cells of hosts that possess markedly different physiology and body temperatures. For this purpose, the interactions of the mutants with human intestinal cells (INT-407) and primary chicken intestinal epithelial cells (PIC) were analyzed using the gentamicin protection assay as described elsewhere [29, 30]. All cells were incubated in a tissue culture chamber (5% CO2) either at 37°C or 42°C corresponding to the hosts’ body temperatures. Our results show that ΔnrfA adhered to PIC in significantly higher numbers, while ΔfdhA and ΔhydB were significantly deficient in adherence as well as invasion of the chicken cell monolayers (Figure 3a). While assessing intracellular survival for the mutants in PIC, no CFUs were retrieved for any of the strains, including the wildtype. This observation corroborated a previous study, which showed that during overnight incubation C. jejuni can escape the PIC monolayers due to the bacterium's inherent mode of colonization of chicken intestinal epithelia . Specifically, Van Deun et al. showed that C. jejuni strains that invaded PIC were not able to proliferate in the intracellular milieu and rapidly exited the cells, supposedly to replicate in the intestinal mucus. It was also suggested that this mode of infection (i.e. short-term entry to the PIC) allows C. jejuni to escape mucosal clearance . 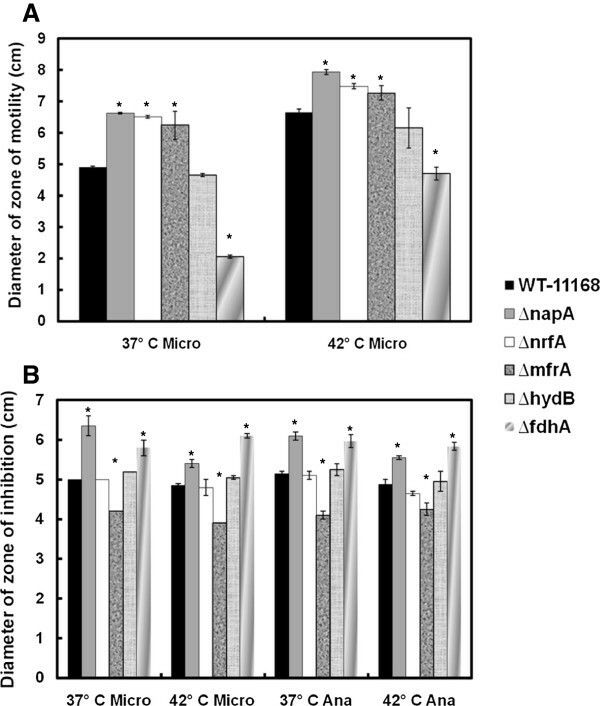 In comparison to the interaction with PIC, all mutants were defective to a varying degree, albeit if not always significantly, in adherence to INT-407 cells, while ΔmfrA, ΔfdhA and ΔhydB were also impaired in their invasion potential and ΔnrfA showed an increased ability for intracellular survival (Figure 3b, Table 1). Notably, ΔmfrA that was not deficient in PIC showed considerable decrease in adherence to and invasion of INT-407 cells, while ΔnrfA did not adhere to INT-407 cells in higher numbers than the wildtype (Figure 3a and b, Table 1). Further, ΔfdhA and ΔhydB decreased potential for the invasion of the INT-407 cells was not as severe as that observed in the PIC (Figure 3a and b, Table 1). Collectively, our results suggest that under our experimental conditions the RPs contributed differentially to the virulent capabilities of C. jejuni. However, it should be noted that the use of in vitro systems in our experiment was meant only to assess the differential contribution of RPs to disparate niches and breakdown the role of these enzymes in cell adherence and invasion and intracellular survival. Therefore, extrapolations of the results to the overall outcome of in vivo colonization should be constrained. For example, it was previously shown that ΔfdhA and ΔhydB were mildly impaired in the colonization of chickens, while ΔnapA and ΔnrfA were retrieved in significantly low numbers from this host [8, 10]. Further, the ΔmfrA was not deficient in the colonization of chickens . The mutants’ interactions with PIC and INT-407 cells. The wildtype and mutant strains were added to the monolayers to achieve a multiplicity of infection (MOI) of 1:100, respectively. (a) Adherence and invasion of PIC. 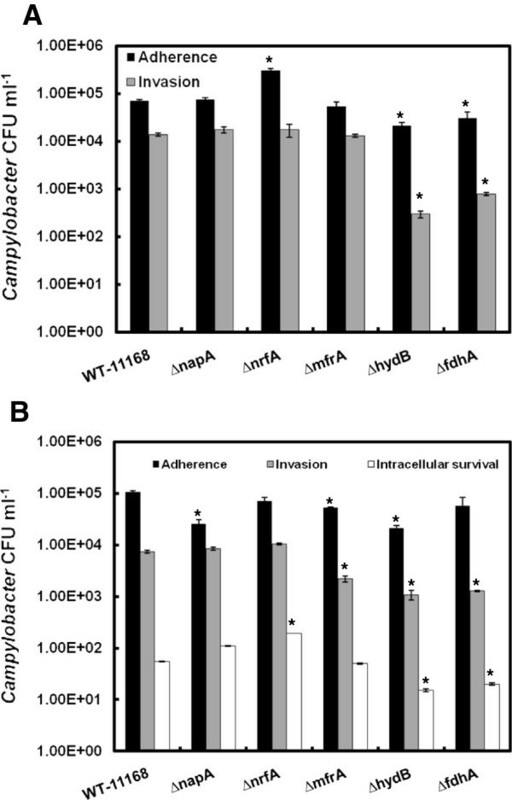 (b) Adherence, invasion, and intracellular survival in INT-407. Statistically significant (P < 0.05) differences are highlighted with * and indicate comparisons with the wildtype. The experiment was repeated three times independently and samples were tested in duplicate per experiment. Data are presented as mean ± standard error. We further assessed the interactions of the mutants with the eukaryotic monolayers using scanning electron microscopy as described elsewhere . As reported by Eucker and Konkel , our results show that the INT-407 cells exhibited a typical increase in surface ruffling (formation of a meshwork of appendages and filaments) after the addition of the bacteria as compared to the control (data not shown). However, there were no discernable differences in surface ruffling associated with the addition of the various mutants as compared to that of the wildtype. Surface ruffling was not readily apparent in our PIC and could not be clearly described. Further, while the bacterial cell shape of ΔnapA, ΔnrfA, and ΔmfrA did not appear different from that of the wildtype, both ΔfdhA (~ 60-70% of the observed cells) and ΔhydB (100% of cells) exhibited non-typical phenotypes as compared to the spiral shape of the wildtype cells. Specifically, ΔhydB formed elongated filaments that appeared to be made of multiple cells that failed in separation (Figure 4a and b, Table 1), which suggested that the mutant was defective in late cell division. Notably, a similar phenotype was associated with impaired Tat-dependent amidases of E. coli, which are essential for hydrolysis of septal peptidoglycan . In C. jejuni, the amidase-encoding gene (amiA; Cj1269c) lacks a Tat signal peptide and is positioned upstream of the cluster that encodes the hydrogenase complex [15, 34]. Since some proteins can translocate via the Tat system using the signal peptides of adjacent Tat substrates (hitchhiking), it is possible that the impairment of Hyd (ΔhydB) may have resulted in the failure of amidase to translocate to the periplasm . The latter would cause the elongated phenotype observed for ΔhydB cells; however, these conclusions require further experimental confirmation. In contrast, the ΔfdhA cells were almost spherical showing a characteristic bulging (Figure 4a and b, Table 1), while the precise mechanisms that lead to ΔfdhA’s cell morphology are still not clear. Regardless, since the spiral shape of C. jejuni is important for host colonization , we suggest that the morphology of ΔhydB and ΔfdhA may contribute at least partially to their deficient interactions with PIC and INT-407, respectively. Further, since it is hypothesized that the spiral shape of C. jejuni may also be associated with its motility in viscous milieus , the bulging shape of the ΔfdhA might also contribute to its decreased motility (Figure 1a). In addition, it should be noted that follow-up investigations showed that the morphology of ΔhydB and ΔfdhA was independent of their interactions with the monolayers, because the impaired shapes of the mutants were also observed during growth in Muller-Hinton (MH) broth (data not shown). Scanning electron microscopy analysis of the mutants’ interaction with the PIC and INT-407 cells. The filamentous and bulging cell shapes (white arrows) associated with the ΔhydB and the ΔfdhA, respectively, in PIC (a) and INT-407 (b). Our analysis showed that under all tested conditions (microaerobic vs. anaerobic and 37°C vs. 42°C), ΔnapA, ΔnrfA, ΔmfrA, and ΔfdhA were not deficient in growth as compared to the wildtype (data not shown). However, the ΔhydB exhibited a slight but significant decrease in growth only under anaerobic conditions after 24 h of incubation (data not shown). Therefore, the phenotypes reported for the RP mutants in this study were not affected by the growth properties of the cognate strains. Further, previous studies, gene organization analysis, and our complementation studies showed that the phenotypes reported in this study were not impacted by Polar effects. Specifically, qRT-PCR analysis showed that the transcript levels of Cj0786 and Cj0787, genes that encode a hydrophobic protein and a hypothetical protein, respectively, and are located down-stream of the nap operon (napAGHBLD) were not affected by the cognate mutation . A similar observation was noted for Cj1356c, which encodes an integral membrane protein and is located downstream of nrfA. Further, the gene directly downstream of the mfr operon, Cj0440c (encodes a TenA/Thi-4 family protein) , and Cj1263 (encodes recombination protein RecR) which is downstream of the hyd operon are likely not affected by the deletion of mfrA and hydB, respectively, as they are divergently transcribed . The fdh genes are divided into two operons that are transcribed in the same orientation and separated by ~ 67 nucleotides. The operon downstream of fdhA contains fdhD and Cj1507c (encodes the DNA binding protein ModE) . However, the introduction of the individual native genes into the ΔfdhA as well as the other RPs mutants resulted in the complementation of the impacted phenotypes (motility, H2O2 resistance and biofilm formation) (Additional file 1: Table S1). In this study, we showed that RPs contribute differentially to key C. jejuni phenotypes in a manner that depends on the temperature and/or oxygen content of the environment (Table 1). Consequently, we conclude that these proteins partially bestow C. jejuni with its remarkable ability to adapt and survive in a variety of niches, a characteristic that is crucial for understanding this bacterium’s prevalence, persistence and success as a pathogen. RPs mutants were previously generated in the C. jejuni NCTC-11168 background and included ΔnapA (encoding a subunit of the nitrate reductase), ΔnrfA (encoding a subunit of the nitrite reductase), ΔfdhA (encoding a subunit of the formate dehydrogenase), ΔhydB (encoding a subunit of the hydrogenase), and ΔmfrA (encoding a subunit of the methylmenaquinol:fumarate reductase) [8–10]. All strains were cultured on MH agar under microaerobic conditions (85% N2, 10% CO2, 5% O2). Incubation at 37°C or 42°C was performed for comparison between temperatures, while oxygen-limited conditions were generated using the BD GasPak Sachets system, which constitutes an atmosphere of less than 1% oxygen and greater than or equal to 13% carbon dioxide (BD diagnostics, NJ, USA). In this paper, oxygen-limited atmosphere was designated as anaerobic to make a clear distinction with microaerobic conditions. Leaked horse blood (5%, Oxoid, KS, USA), antibiotics (chloramphenicol: 20 μg.ml-1), and the Campylobacter selective supplement (SR155E, Oxoid, KS, USA) were added to the MH medium when necessary. For growth curve analysis, the mutants and wildtype strain were inoculated into MH broth and incubated shaking (200 rpm) at different temperature and oxygen conditions. Growth was monitored by measuring optical density (λ = 600 nm) at different time points. To construct complementation strains, individual native RPs genes (napA, nrfA, mfrA, hydB, and fdhA) along with their potential promoter sequences were amplified from the genomic DNA of C. jejuni NCTC-11168 using specific primers (Additional file 2: Table S2). The primers were designed to include restriction sites that facilitate directional cloning. The PCR products were digested, purified and ligated into a similarly digested pRY108 plasmid using a Fast-Link DNA ligation kit (Epicentre). The ligated product was then cloned into Library Efficiency DH5α E. coli competent cells (Invitrogen, WA, USA). The resulting plasmids were then purified and introduced into the cognate mutant strains by electroporation as described previously . Electroporated cells were spread on MH agar plate supplemented with kanamycin and chloramphenicol and incubated at 42°C for 2 to 3 days under microaerobic conditions. Single colonies representing the complementation strains were streak purified and used for further studies. The motility of the RP mutants was determined as described by Fields and Thompson . Briefly, the Campylobacter cultures were adjusted to OD600 (optical density at λ = 600 nm) of 0.02. Two μl of each culture were then stabbed into semisolid MH plates containing 0.4% agar. The plates were incubated either at 37°C or 42°C under microaerobic conditions. Diameters of the zones of motility were measured after 48 h of incubation. The experiment was repeated at least three times and samples were tested in triplicate. Motility under anaerobic conditions could not be assessed, because the zones of motility were not defined and sufficiently large for reliable measurement. The resistance of the RP mutants to H2O2 (oxidative stress) was determined using a diffusion assay . One-hundred μl of each of the Campylobacter cultures (OD600 of 1.0) were spread onto MH agar plates. A hole (5 mm in diameter) was aseptically created at the center of the plates and filled with 30 μl of 3% H2O2. The plates were then incubated at 37°C or 42°C under microaerobic or anaerobic conditions. The diameter of the zone of inhibited growth was measured after 48 h of incubation. All experiments were repeated at least three times and samples were tested in triplicate. The impact of RP deletions on C. jejuni’s ability to form biofilms was determined using the crystal violet staining assay as described previously [15, 17]. Briefly, the Campylobacter cultures were suspended in MH broth to achieve an OD600 of 0.05. One ml of each culture was transferred to sterile borosilicate glass tubes, which were incubated for 72 h at different conditions. The tubes were then gently washed with distilled water and stained with 0.1% crystal violet for 15 min. After further washing to remove excess stain, the tubes were left to dry at room temperature. The biofilms were then dissolved in 80% DMSO and quantified spectrophotometrically (λ = 570 nm). All experiments were repeated at least three times and samples were tested in triplicate. The impact of RP deletions on C. jejuni’s virulence associated traits was assessed in vitro using human intestinal cells [39, 40]. For this purpose, 105 cells ml-1 of INT-407 (human embryonic intestine cells, ATCC CCL 6) were seeded into each well of a 24-well tissue culture plates in Minimum Essential Medium Eagle (MEM, Fisher scientific, PA, USA) supplemented with 10% fetal bovine serum (FBS, Fisher scientific, PA, USA). The plates were then incubated at 37°C in a humidified incubator with 5% CO2 to obtain semi-confluent mono-layers. Before infection with the C. jejuni strains, the INT-407 mono-layers were washed three times and covered in MEM supplemented with 1% FBS. Similarly, the C. jejuni cultures were washed 3 times and suspended in MEM supplemented with 1% FBS to obtain 107 bacteria ml-1. One ml of bacterial suspension was added to each well containing the INT-407 semi-confluent monolayer, achieving a 1:100 multiplicity of infection (MOI). To assay for Campylobacter adherence, the infected monolayers were incubated for 3 h, which was followed by washing the cells 3 times with 1X PBS, lysis using 0.1% (v/v) Triton X-100 and serial dilution (10-fold) in 1X PBS. One hundred μl of each dilution were spread on MH agar plates. The agar plates were then incubated for 48 h at 42°C under microaerobic conditions after which CFU were counted. To assay for invasion, infected monolayers were incubated for 3 h, washed 3 times with MEM supplemented with 1% FBS and then treated with gentamicin (150 μg.ml-1) for 2 h to inhibit the bacteria that did not invade the cells. At the end of the incubation, the infected mono-layers were washed, lysed, and serial dilutions were plated as described earlier. The number of bacteria that invaded the cells was determined by counting CFUs. For the intracellular survival assays , Campylobacter cultures and the INT-407 cells were processed as described above. The monolayers were then covered with MEM containing 1% FBS and gentamicin (10 μg.ml-1) and incubated for additional 24 h at 37°C. Following incubation, the monolayers were washed, lysed and processed as described above. The number of viable intracellular bacteria was determined by counting CFUs. For each assay, strains were tested in duplicate, while the experiment was repeated three times on separate occasions. The potential of the RP mutants to adhere to and invade chicken epithelial cells was assessed using primary chicken intestinal epithelial cells (PIC). PICs were isolated using a method described previously  with modifications. Briefly, the intestines from 11-day-old chicken embryos (Charles River Laboratories, CT, USA) were harvested and suspended in DMEM supplemented with penicillin and streptomycin (100 U.ml-1 and 100 μg.ml-1, respectively). Intestines were fragmented into smaller pieces and washed twice with DMEM. Then, the intestinal fragments were placed in a 70 μm nylon mesh filter and gently crushed with a 2 ml syringe piston to obtain a single cell suspension. The cells were then washed twice and the pellet was resuspended in DMEM supplemented with 10% fetal bovine serum and transferred to 25 cm2 cell culture flasks. After 7–10 days of incubation, examination using a microscope showed typical cuboidal morphology characteristic of epithelial cells. Before using these cells in the experiments, their purity was confirmed by immunofluoresent examination of the expression of pan-cytokeratin using mouse anti-human pan-cytokeratin mAb (Sigma). Expression of pan-cytokeratin was detected on 100% of the cells assayed (data not shown). PICs were then seeded into 24-well tissue culture plates and assays for adhesion, invasion and intracellular survival of C. jejuni were performed as described for the INT-407 infection studies. To further investigate the interaction between the RPs mutants and the INT-407 cells and PIC, infected monolayers were analyzed using scanning electron microscopy (SEM) as described previously  with minor modifications. Briefly, different cell types were grown on HCl treated glass coverslips. The C. jejuni strains were added to the monolayers at an MOI of 200. After 3 h of incubation, the cells were gently washed with 1X PBS and fixed (3% glutaraldehyde, 2% paraformaldehyde in 0.1 M potassium phosphate buffer, pH 7.2) at 4°C overnight. The samples were then rinsed in 0.1 M potassium phosphate (3 times with 15 min incubation for each step) and post-fixed with 1% osmium tetroxide for 1 h at room temperature in the dark. This was followed with serial dehydration of the samples in ethanol, critical point drying and platinum sputter-coating (Molecular and Cellular Imaging Center, Ohio Agricultural Research and Development Center [OARDC]; http://www.oardc.ohio-state.edu/mcic). The samples were visualized and imaged using the Hitachi S-4700 scanning electron microscope. All samples were tested in duplicate and non-infected monolayers were used as controls to assess morphological changes associated with the bacterial infection. Data were expressed as mean ± SE (standard error) and statistical analysis was performed using the student’s t-test. A P value of <0.05 was considered statistically significant. Unless otherwise indicated in the text, the reported statistics highlight comparisons between each mutant strain and the wildtype. We thank Tea Meulia, Andrea Kaszas, Leona Horst, and the Molecular and Cellular Imaging Center (MCIC) for assistance with SEM. Research in the Rajashekara laboratory is supported by funds from the USDA, the Ohio Agricultural Research and Development Center (OARDC), and the Ohio State University. IIK and GR conceived and designed the study. IIK, MK, MAE, and YMS performed the experiments. JWO provided the mutants. IIK and GR wrote the paper. IIK, GR, JWO, MAE and YMS reviewed and edited the manuscript. All authors read and approved the final manuscript.